The domain within your query sequence starts at position 2 and ends at position 143; the E-value for the DWA domain shown below is 9e-43. 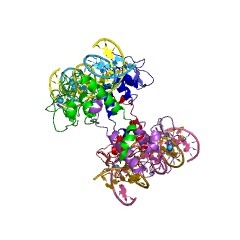 This entry represents the MH1 (MAD homology 1) domain is found at the amino terminus of MAD related proteins such as Smads. This domain is separated from the MH2 domain by a non-conserved linker region. 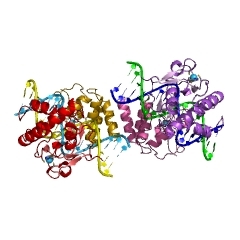 The crystal structure of the MH1 domain shows that a highly conserved 11 residue beta hairpin is used to bind the DNA consensus sequence GNCN in the major groove, shown to be vital for the transcriptional activation of target genes. 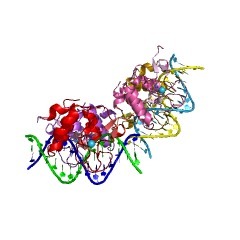 Not all examples of MH1 can bind to DNA however. 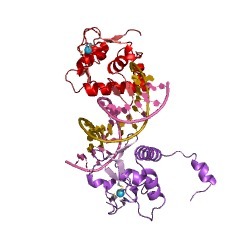 Smad2 cannot bind DNA and has a large insertion within the hairpin that presumably abolishes DNA binding. 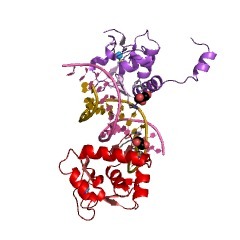 A basic helix (H2) in MH1 with the nuclear localisation signal KKLKK has been shown to be essential for Smad3 nuclear import. Smads also use the MH1 domain to interact with transcription factors such as Jun, TFE3, Sp1, and Runx [(PUBMED:11532220), (PUBMED:9230443), (PUBMED:8799132)]. There are 7131 DWA domains in 7116 proteins in SMART's nrdb database. Taxonomic distribution of proteins containing DWA domain. This tree includes only several representative species. 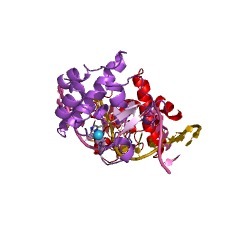 The complete taxonomic breakdown of all proteins with DWA domain is also avaliable. 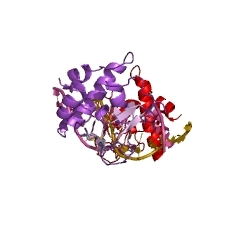 Click on the protein counts, or double click on taxonomic names to display all proteins containing DWA domain in the selected taxonomic class. This information is based on mapping of SMART genomic protein database to KEGG orthologous groups. Percentage points are related to the number of proteins with DWA domain which could be assigned to a KEGG orthologous group, and not all proteins containing DWA domain. Please note that proteins can be included in multiple pathways, ie. the numbers above will not always add up to 100%.